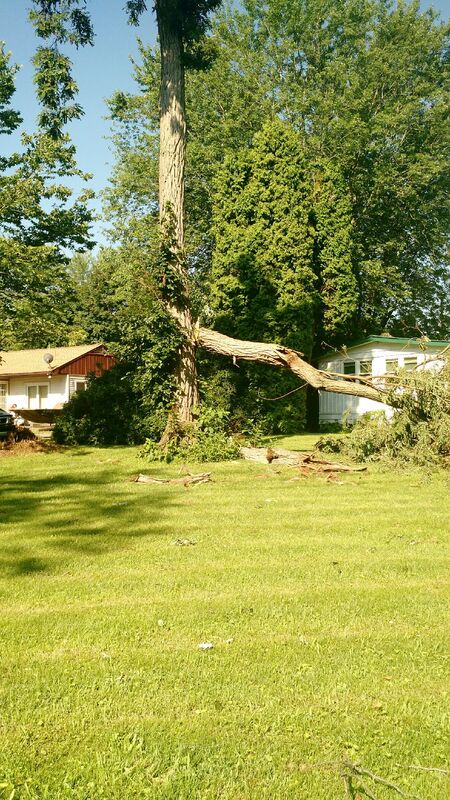 A twister struck the Isle of Q in Selinsgrove on Thursday, July 9. The trees crashed down all over the road blocking traffic and sending emergency crews racing towards the river. “It was 5:00 and I was walking home from work. A big gust of wind came and it started pouring!” Andrew Onschowsaka, a witness, told the Orange Street News. “It was really something,” added Onschowaska. More than anything, residents of the Isle are just thankful that no one was hurt. “It went through a house then through Penn’s Creek. I feel lucky”, said resident Bob Moyhow, who lives on the Isle. The EF0 tornado caused mostly tree and crop damage near Selinsgrove in Snyder County, according to the National Weather Service. Some Isle residents made the best of a scary situation by cutting up the trees that fell down and turning into firewood for the up coming winter. This entry was posted on August 1, 2015 by Hilde Kate Lysiak and tagged Hilde kate lysiak, Orange Street News, selinsgrove, tornado, twister.